So you have a problem with day-biting, aggressive tiger mosquitoes? Swatting a few simply will not do the trick, and neither will an ultrasonic repeller. Light traps do not help much either, especially during the day (and even at night, letting masses of beneficial insects die in a light trap just to destroy a handful of mosquitoes may not be the best idea). Solving the problem is actually quite simple: You need the right capture performance to combat mosquitoes effectively. A significant share must be withdrawn regularly from the mosquito population. Thus, the population will shrink, and less offspring will be produced. Only then you will get a significant control effect on the mosquito bite pressure in your back yard and on your patio. And Biogents’ mosquito traps do have the right capture performance. Originally developed as a tool for scientists and and public health professionals, Biogents tiger mosquito traps were a game changer with unprecedented capture rates. Today, they are the scientific gold standard to catch tiger mosquitoes. Most scientists use them in the form of the BG-Sentinel, because it is light-weight, foldable and easy to transport. The more rugged version for continuous and stationary use, the BG-Mosquitaire, is just as good. And it is good enough to make a difference in your back yard, too. Mosquitoes are attracted to these Biogents traps in almost the same way they are attracted to a human, and tiger mosquitoes mostly rely on skin odours to home in on their host. The black and white contrasts are additionally attractive. However, tiger mosquitoes would still decide in favor of a human being if given the choice. Unfortunately, no one has come up yet with a trap that is more attractive than a human. But unlike a human, the trap is there all the time, lures mosquitoes from the surrounding area and removes them every time they are active. You can check the capture rate any time by glancing into the trap bag and counting the mosquitoes that will no longer bite you. The radius covered by the trap is a maximum of about 20 yards. Accordingly, you do not need to worry about additional mosquitoes from a greater distance being drawn into your garden. To see if our trap can really help, we measured their effect. We checked gardens together with health authorities and mosquito control organisations to find out whether test persons were bitten less with Biogents mosquito traps. Figure: The effect of Biogents traps on the bite rates of Asian tiger mosquitoes in three test zones in Cesena, Italy, compared to three zones without traps. A measurable decrease in the frequency of bites in gardens was already evident within a few days with Biogents traps. 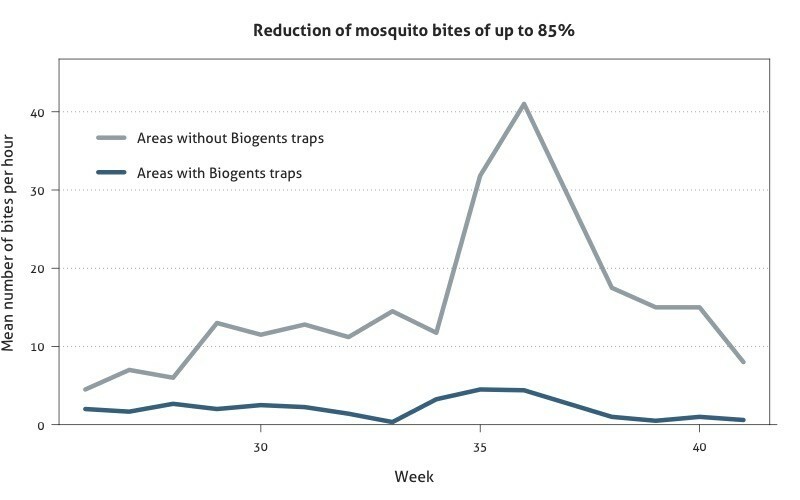 A 85 % decrease in tiger mosquito bites, compared to control gardens without traps was even achieved in the course of the season – without the use of insecticidal fogging or spraying. Although it will never be possible to achieve 100 % protection against mosquito bites outdoors, such a decrease in biting rates will make a difference. The BG-Mosquitaire catches the mosquitoes that are looking for a blood meal. But there may still be others around: Those that were lucky, still got a blood meal somewhere, developed eggs and are now looking for a place to lay the eggs, a oviposition site. One female tiger mosquitoe can lay between 50 and 150 eggs. But they don’t put all theit eggs into one basket. Rather, they fly from one water container to the other and lay a few in each. This behavior can additionally be exploited in a smart mosquito control with traps. Another trap type, the BG-GAT targets these egg-laying mosquitoes by offering them what seems like a perfect place for their offspring. But they really end up on a sticky board. To further raise the chance for the mosquitoes to get caught out the BG-GAT, find as many other oviposition sites (containers with standing water, buckets, vases, tires, clogged drains), drain them and clean them up. More infos on this can be found on our page “Controlling container-breeding mosquitoes“. Under normal circumstances, two BG-GATs and one BG-Mosquitaire should do the job. This is why we call this the 2+1 concept. If you are interested, you can get a 2+1 bundle in the Biogents webshop.